The Super Eagles overpowered the Desert Foxes of Algeria to seize control of the group in the World Cup qualifying campaign with 6 points to their credit following a 3-1 win at home. The Eagles were in top form with goals from Chelsea midfielder John Obi Mikel in the 42nd minute in between Victor Moses’ brace in the 26th and 91st minutes of the game to ensure Eagles victory in the encounter. With the 3-1 win at home the Eagles leads the group with six points above closest rivals Cameroon who just have two points following a 1-1 draw at home with Zambia. The Eagles might have had a buoyant outing against Algeria but we take into consideration some key things as regards to the game. The Super Eagles winger was terrific all night and got a brace to show for it, with one of the goals coming in dying minutes of the game. The Chelsea man drew the first blood in the 26th minute following a mix-up in the Algerian box before applying the finish in the bottom corner to give Nigeria the lead after he was set up in transition by the Eagles skipper for the breakthrough. The 25 years old who is enjoying a fine moment of his carrier at Chelsea under the management of Italian gaffer Antonio Conte who is a huge admirer of the Nigerian talent, was a threat down the wings as he caught the Algerian back line out of position. Moses was outstanding in the game and crowned it all with a goal at the closing stage to end any possible chance of an Algerian comeback much to the delight of the home fans in Uyo. 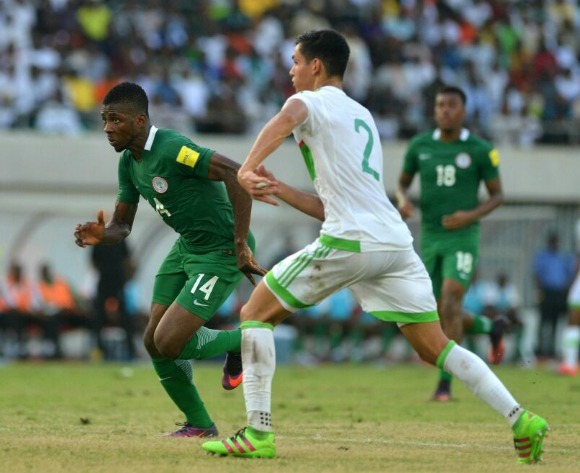 The Manchester City forward had a quiet game against Algeria after been deployed as a center forward ahead of more experience point man in Brown Ideye and Odion Ighalo. It was evident that the Manchester City man was not so comfortable in that position as he was mostly out of play in the course of the 90 minutes. The forward was deployed in the position due to his potency in front of goal but the golden boy fired blank after he was set up by Ahmed Musa in the 89th minute of the game. It was a game where the young lad was not able to initiate attacking moves as he was the point man causing him wonder mostly alone in the attack. For a player who have an ability to create and finish himself, it’s no surprise that he is picked to lead the central role as goal scoring is the fundamental of the game but in Kelechi’s case Nigeria must return him to his best position which is behind the striker (free role) to aid this effect in match proceedings for the Super Eagles in the near future. The former Youth international and Kano Pillars star was mostly under-utilized in the Super Eagles, understandably, but after a five star performance at the Olympic Games in Rio, one expected the Super Eagles crew to hand him the right back role especially with the defensive inconsistency in that position playing Omeruo (against Algeria) and Ndidi (against Zambia) was really worrisome and menacing for the Super Eagles as they lack enough fluency to rightly man the right back. The likes of Yacine Brahimi and Rainford Kalaba were a thorn in the flesh of our right back (Omeruo and Wilfred Ndidi respectively) as they drifted in and out of the duo thus leaving the Eagles backline in imbalance. Shehu Abdullahi was good and mobile enough and should be allowed to continue in that role in the near future but with credible competitor to keep him on his toes. At that level of the game you play only to the referees’ instructions and not to whatever you might have taught is the right decision. Towards the end of the first half with Nigeria leading 1-0, Iwobi retrieved the ball back to Etebo in midfield who viciously found the Eagles skipper free in the box with an Algerian defence keeping him on side. The referee allowed proceedings and the Super Eagles Captain, Mikel scored the easiest of goals more like a penalty as he turned to hook the ball into the net with the Algerians protesting for an offside which was to no avail as Eagles solidified their advantage with a 2-0 lead in the first period. With the score line at 2-1 and with a possible comeback for the Algerians, Ahmed Musa was sent into the game to increase Eagles attacking potency. Off came Alex Iwobi who had a moderate game after that rainbow flick over an Algerian player to be replaced in the 75th minute for the Leicester City forward. Musa made an immediate contribution with brilliant forward runs into the Algerian box to cause a first scare for the visitors. He then ran the rule from the right wing to swing in a low cross which Iheanacho missed. On the left his cross was turn in for a corner kick when trying to set up Iheanacho (well positioned) as pressure built-up on the visitors. At the closing moment the reward was reaped as the Leicester forward set up Moses for the second goal and the icing on the cake confirming his influence in the game.